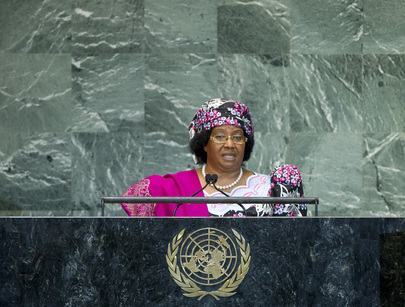 JOYCE BANDA, President of Malawi, said that while joining the world’s leaders and addressing the Assembly as only the second-ever woman to lead an African nation was “a moment of pride”, hers was not a story of individual success but of the achievement of a people who had shown courage and determination in ushering her into office through a peaceful constitutional transfer of power just a few months ago. “The people of Malawi have made a decisive choice: they have chosen democracy; the have chosen peace; and they have chosen to work together to realize their destiny,” she said. Turning to the work of the United Nations, she agreed with the Secretary-General that achieving sustainable development for all was the best way to ensure a peaceful and stable world. Indeed, the greatest threats to peace were poverty, lack of opportunity and lack of hope. It was unacceptable to her — and should be so for all leaders — that children still suffered from malnutrition, or as they learned, had to sit outside under trees rather than indoors in proper classrooms. It was also unacceptable that so many of the world’s youth had few opportunities to realize their potential; or that farmers toiled in the fields, but due to lack of modern technologies, could not get their produce to market, and even if they could, found their way barred further by taxes and tariffs. She said that as a social justice and human rights activist in Malawi she had pressed hard for progress on those and other issues and would continue to do so now. Her vision was to eradicate poverty through economic growth and wealth creation. The country would create wealth by transforming the structure of its economy, promoting private sector activity to accelerate job creation. It would also protect vulnerable communities, she said, adding: “My vision is to transform Malawi to become one of Africa’s fastest growing economies in the next decade.” She saw growth as more than gross domestic product; it was about opportunity, wealth, health and prosperity for all. Continuing, she said that for the past three years, Malawi had faced severe socio-economic challenges brought on by poor political and economic governance. That situation could impact the country’s efforts to attain the Millennium Goals and, therefore, one of her first priorities had been to initiate a recovery programme to restore Malawi’s macroeconomic stability. She was certain Malawi would achieve five of the Goals by the 2015 deadline, and the country would continue to strive towards reaching the final three — on universal primary education, gender equality, and maternal health. She stressed that her vision for the country was “more than words” and tough decisions would be taken to ensure that Malawi harnessed its vast potential. She was committed to seeing a change in the perception that Malawi was stuck in a state of underdevelopment. Concluding, she called for the full implementation of the 2011 Istanbul Programme of Action on the Least Developed Countries, particularly in the priority areas of duty-free market access and supply-side capacity-building. In addition, she noted that the world’s poorest countries were increasingly feeling the impacts of climate change, which was causing devastating floods, environmental degradation and lasting droughts. With that in mind, she welcomed the outcome of the Rio+20 summit and stressed that implementation of the commitments set out there “is very crucial for our future”.